Grape clusters were selected from the Hudson Valley Laboratory ‘cold hardiness’ vineyard on 16 August with preference to varieties nearing harvest. Selected berries were removed from the cluster, subsampled and analyzed for Brix value, with 4 berries of each variety, weighed with stems and checked for damage before being introduced to paired SWD. In choice and non choice tests, 10 adult SWD (5 M/ 5F) were anesthetized, using 5-minute exposure to cold temperatures (45 F), and placed in containers with moisture wicks and 4 berries / variety. Flies were sealed with berries for 48 hours, after which time fruit was inspected for ovipositional sites for eggs and larva with time allowance made for larval development to include pupal stage. Numbers above bars represent the mean brix of a 2 berry juice analysis. Grape Variety Testing for SWD oviposition: Choice, no choice tests. 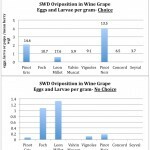 From this initial study it appears that SWD oviposition can occur in HV grape varieties, which may require preventative control measures if adults are present in the vineyard. 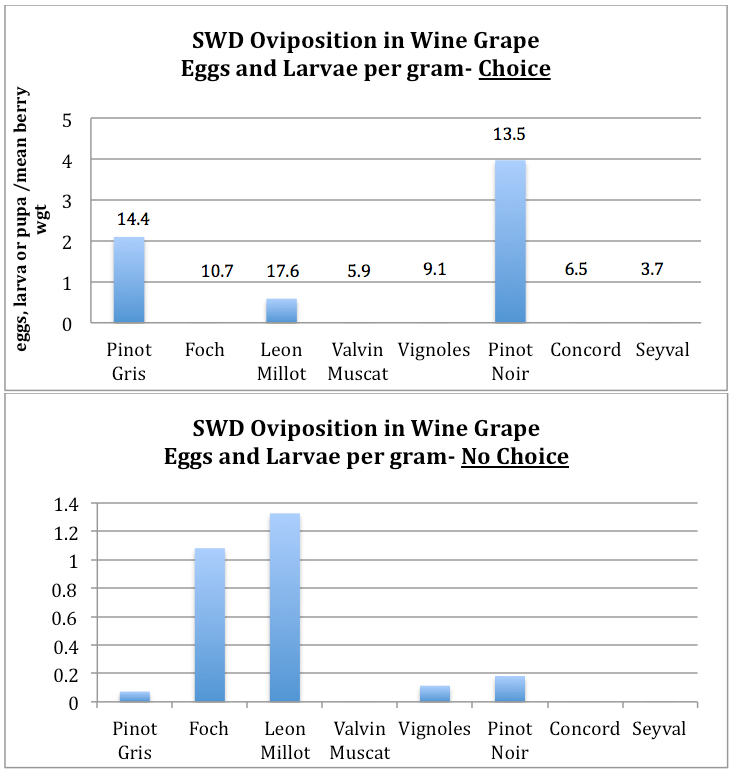 However, it is important to note that only field collected samples of Leon Millot and the 144 strain of Pinot Noir contained Drosophila oviposition from which we were able to rear SWD adults in 2013. In 2012 we did see oviposition of Drosophila eggs in sound Vignoles berries yet were unable to rear out adult SWD.